Last night I posted on social media about how Scooter was attacked a few days ago by another dog and that he's alive and recovering, but could use any and all good healing thoughts coming his way. We have been completely overwhelmed by friends and family showing their support of our little pup and sending well-wishes his way, as well as asking if there is anything they can do. The support we have seen is amazing, and we thank everyone who has reached out to us. With that said, I have gotten a'many text messages and emails asking, "What happened to Scooter?? ", obviously beyond what I posted on social media. Hey, I get it, I'd be wondering the same thing too if one of my friends posted something similar about their animal--I'd want the inside scoop. Here's the deal: the other dog that attacked Scooter is my brother Charlie's dog Lucy--I am NOT (as I have told Charlie so many times since Thursday) bad-mouthing Charlie or his dog...things happen. I was hesitant to even post on social media and/or write this post because I don't want it to come off as bashing him or his dog--this is NOT that at all. It's about Scooter, and that's it. So obviously yes, I am upset Scooter was attacked, but not at Charlie AT ALL, more so that my furbaby was hurt (regardless of who was doing the hurting). As much as I hate to see Scooter in pain or hurt, this was a learning experience, and we now know that Scoots needs to probably be kept away from other big dogs (especially ones that he's not super familiar with), but also that Lucy probably needs to only play with big dogs her size. Anyway, I just wanted to emphasize that this post is not bashing Charlie or Lucy, but more so just detailing on the events of Scooter's attack and his recovery...so I figured I'd take to my blog and share what happened to Scoots and his recovery thus far (I'm sure I'll have an updated post with even more details later on), so here it goes. Mike was working evenings (don't even get me started on his "until further notice" 7pm - 7am no days off schedule) so Patrick, Scooter, and I went to my parents for dinner on Thursday night. My brother Charlie and his German Shepherd Lucy are currently living with my parents, so they were there for dinner too. Scooter had met Lucy a few times before, and even Thursday night was out on the back deck with her and they sniffed each other but were like "no big deal" and let the other one go about his/her business. For dinner time, Scooter stayed in the kitchen with us, but Lucy was put in the family room behind a gate--not sure if this is what set her off or not, that Scooter got to be in the kitchen for meal time and she didn't, but shortly after dinner I took Patrick in to the family room to play while Charlie got Lucy to take her back downstairs. I'm not really sure exactly what happened, but instead of going downstairs, Lucy diverted to the kitchen table where Scooter was underneath, and something happened, because the next thing I knew Scooter was yelping and barking and so was Lucy. Charlie thankfully leapt in right away and grabbed Lucy and literally pried her mouth open (where she had Scooter by the neck) and I came running in and grabbed Scooter from Lucy's mouth. Unfortunately Patrick was in the doorway and saw the entire thing--and saw his mom crying--so he started crying and got really upset. Poor fella. So as soon as I grabbed Scooter he scurried out of my hands and hid underneath my parents' computer table. Scooter was visibly upset, and covered in blood all around his neck and back, but would not let me (or anyone) grab him from under the desk--he was growling and snarling at us and trying to bite anyone who got near him. I had my dad call the animal hospital and tell them we'd be bringing in a small dog that was just attacked by a German Shepherd so they'd be ready for us, while my mom got a laundry basket that we put over Scooter and we were able to drag him out. Patrick kept trying to go in and get Scooter too--he had stopped crying but really wanted to get to his puppy. Once Scooter was out from under the desk, I was able to wrap him in towels and hold him while my dad got us in the car and drove us to the animal hospital. To say I was calm is a lie: I was a hysterical crying mess, thinking my poor dog who I've had for 7.5 years was going to die. My dad kept reassuring me that he'd be okay, that he's awake and breathing so those are all good signs. I somehow managed to call Mike at work and tell him what happened so he said he'd leave work and meet me at the hospital. When we got to the animal hospital they immediately took Scooter from me and took him back. 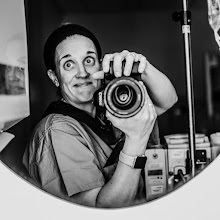 Then I really lost it--I'm sure the people in the waiting room thought I was some crazy emotionally-wrecked pregnant woman. 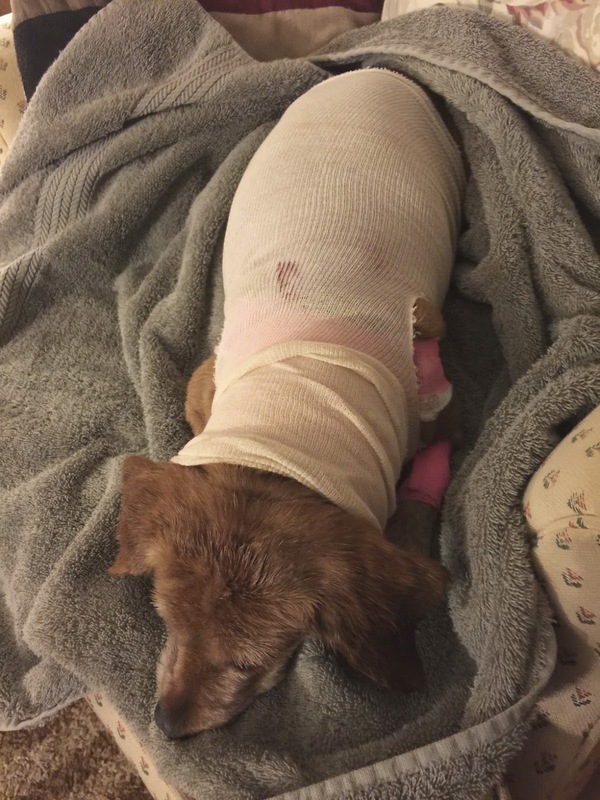 I didn't care--I was so worried about my puppy. They took us back into a room, and the vet came in after a little bit and said that Scooter's vitals look good, he's definitely shaken up and has a lot of wounds, but they are going to sedate him so they could get an x-ray and assess the wounds without him moving. By the time Mike had gotten to the hospital from work, so that was really nice that he was able to come and be there for Scoots. After what felt like an eternity (really it was maybe 15 minutes) the vet came back in to show us Scooter's x-rays and tell us about his injuries. 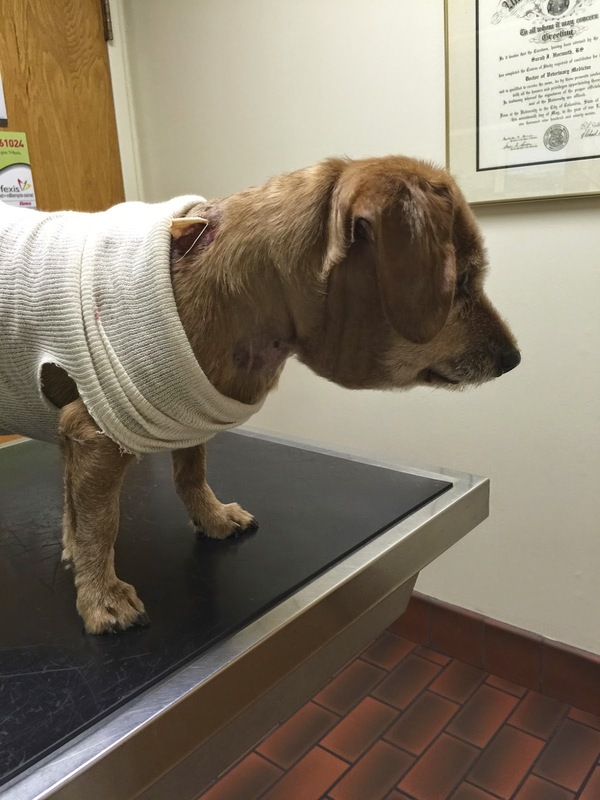 She said, given the dog that attacked him and where his injuries are, that it was a miracle that his arteries, jugular, windpipe, or bones were not injured. Thank the good Lord above! This was great news. However, he didn't escape totally injury free--since Lucy shook Scooter when he was in her mouth, she pulled his skin away from his back and neck muscles therefore creating a place for fluid to build up under his skin. They try and resist putting stitches in dogs with bite wounds unless they absolutely have to, because of the bacteria from the other dog's mouth can be "closed in" inside the wound, but for Scooter, his were deep enough that they'd have to sew some of them closed, but first they'd sew a drain in his neck/back to drain that excess fluid that needed to come out. Yeah, totally gross. Sorry for those with weak stomachs...but I figured I'd give the inquiring minds a visual (cause shoot, I'd want one). Anyways, so after he came out of sedation and was bandaged up, and we were given some pain meds and antibiotics for him, Mike went back to work (sad face) and I took Scooter home on Thursday night. He was still super drugged up, and just laid on the chair (then bed) and didn't move much. Poor guy had been through a lot, he just wanted to sleep. I couldn't stand it. That was the cutest thing ever--I may have shed a few tears. Anyways, I couldn't get home on Friday fast enough to see Scoots--I actually had to take him back to the vet for a wound and drain check and for new bandages to be put on. He looks quite excited in this pic, but was actually panting because he was so anxious to be back at the vet. I ended up just holding him until the vet came in because he was panting and shaking so bad. I don't blame him; I don't like going to the doctor either. The vet said his drain was draining nicely, and put some new bandages on him (which Mike replied, "Do they know he's a BOY dog?!! 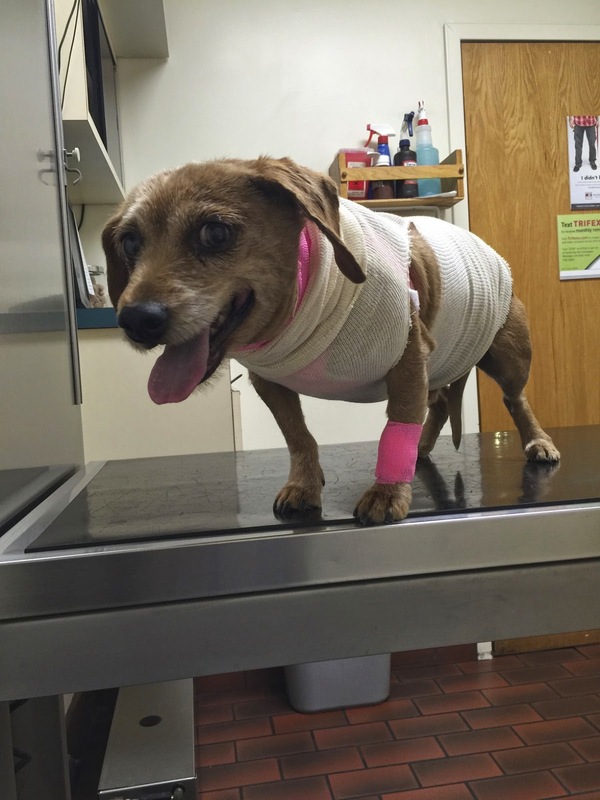 Why the pink bandages?!!" who knows.) and had us come back on Tuesday for hopefully a drain removal. I was suppose to have a couple photo shoots this past weekend, but ended up canceling them due to the forecasted weather (RAINNNNNN) and that I didn't want to leave Scoots, especially with Mike working 7pm-7am all weekend. I wanted to do nothing but lay low and hang with Scooter to make sure he was doing okay...and Patrick didn't seem to mind that either. After several reminders to be "gentle" and "nice" to Scooter because he wasn't feeling good, I think he got the picture. 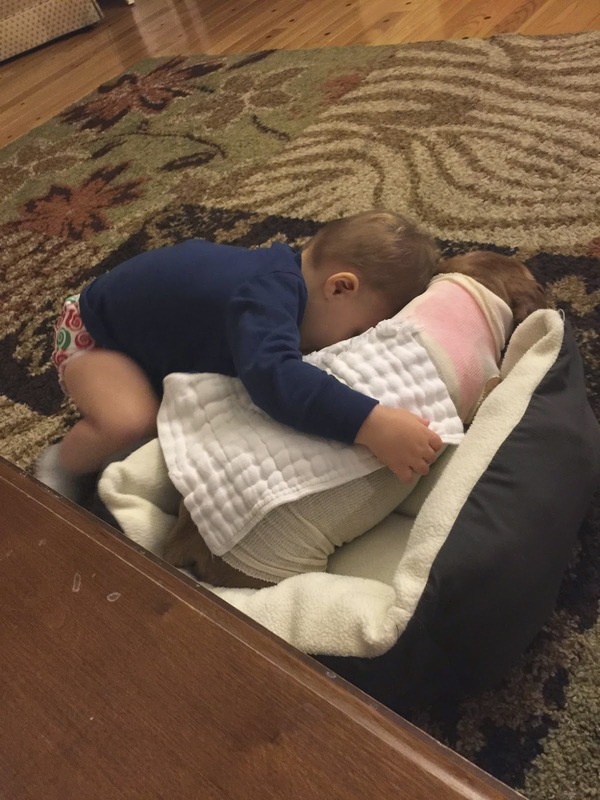 I caught him snuggling with his puppy brother (and even giving him his beloved nappy) on Friday night and it about melted my heart...again. The entire weekend pretty much went exactly like that: Scooter would get out of bed to go potty, then hop right back up in bed. He'd eat his cheese (that his meds were in) and drink some water, but that's about it. He spent most of the weekend on the couch or in bed. I mean, he usually sleeps A LOT anyways, but he was definitely more lethargic and sedate than he usually is. We kept reminding Patrick to be gentle to his puppy brother because he's sore and healing. 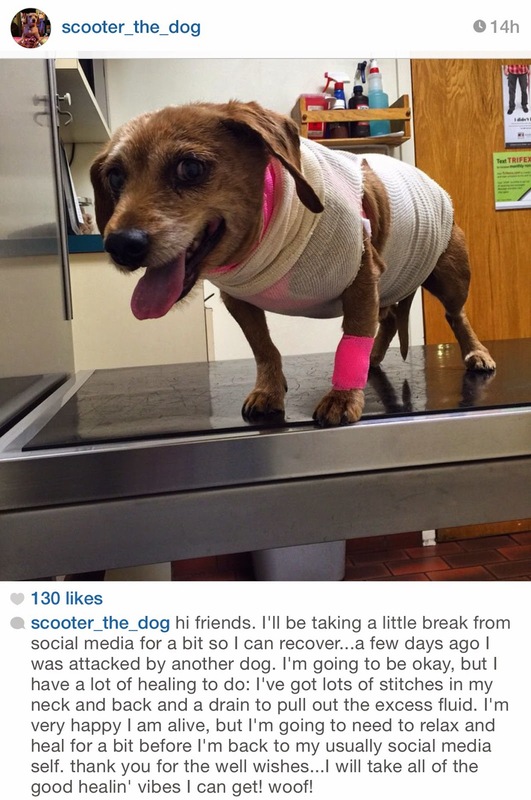 On Sunday, however, Scooter looked VERY swollen, especially around his neck and jaw. not gonna lie, this pic makes me giggle. he looks like a cartoon character! We had another appointment on Tuesday for him, but I elected to give our awesome vet a shout on Sunday night with some pics included and ask her what we should do. 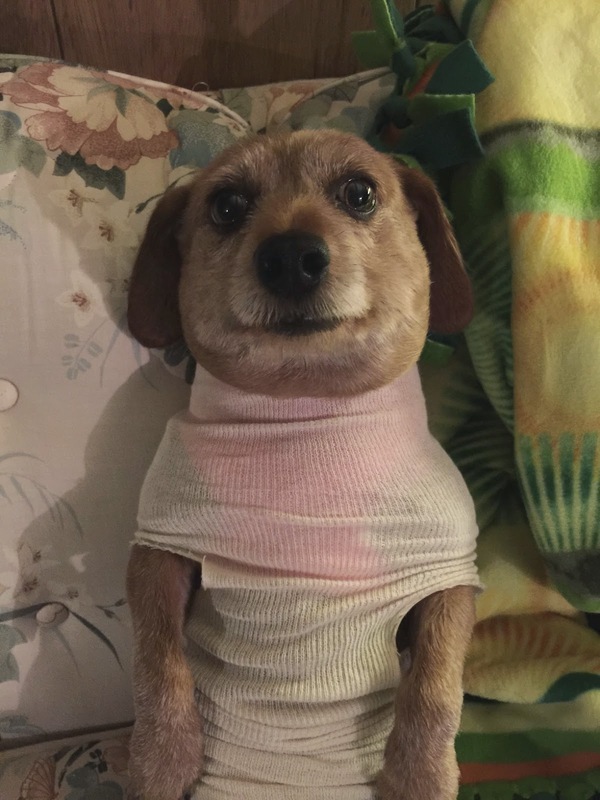 She had us remove his bandages but keep his little sweater on, and then bring him in first thing Monday morning so she could take a look at him. Fortunately the animal hospital opens at 7am, so I was able to bring him before I went to work. Yeah, I snapped this pic at the vet this morning: doesn't he look silly?!! Poor fella, so much fluid (or what I thought!) was in his neck and head! So the vet came in this morning and checked him out--luckily his temperature was normal, which is a very good sign (again, thank the good Lord! 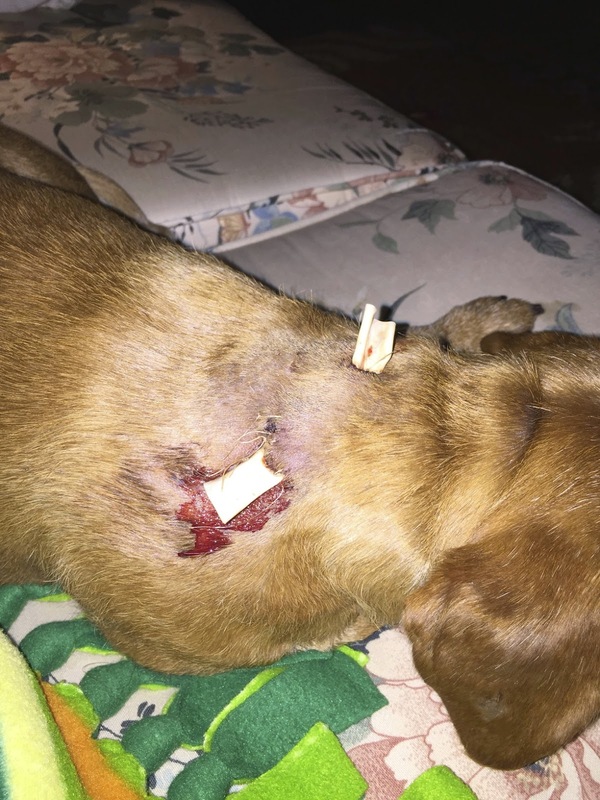 ), but she was concerned that the swelling did not go down overnight, so she took him back to check him out further, and maybe put another drain in in the bottom of his neck. It turns out that what I thought was fluid in his neck/head was actually blood clots that she saw via ultrasound, that unfortunately cannot be drained until they're unclotted, so putting in another drain won't help that for now. 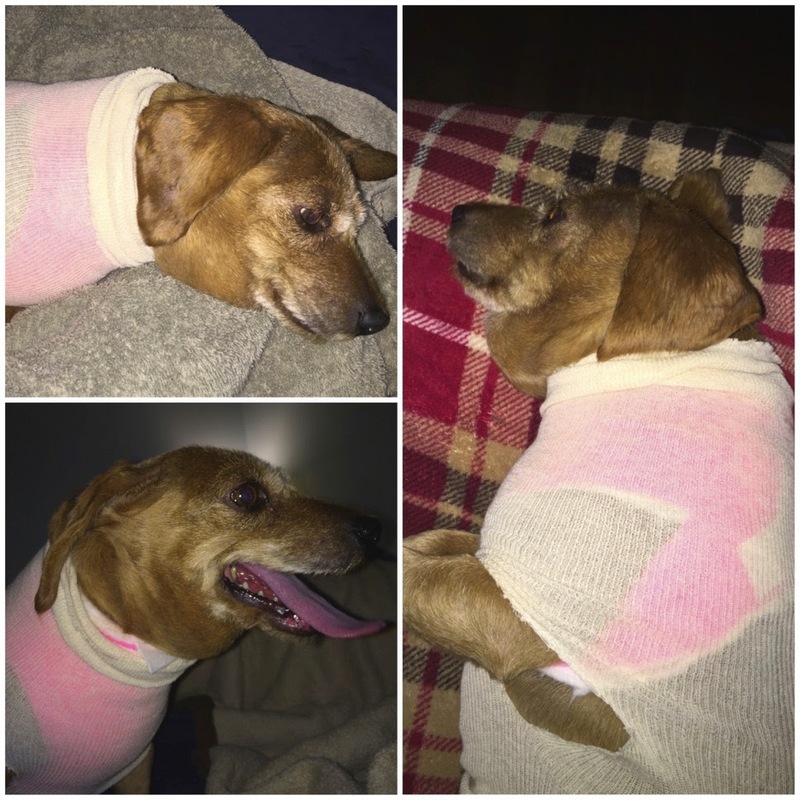 She did do some laser treatments on his neck that is suppose to help unclot the clots and hopefully have the swelling to start going down. She left his bandages off, so that those don't contribute to any more swelling and hopefully allow the clots to unclot themselves and go down. I am taking Scooter back on Wednesday morning for possible another laser treatment and to check on his drains. Not sure when those are coming out, but the vet said she wants to leave them in until all of his swelling has gone down. I took Scoots back home--just as Mike was getting off of work--so I'm sure they're both snuggled up in bed taking a long siesta until I get home later this afternoon. Anywho, this is where we stand as of Monday morning with Scooter. He's got a ways to go ahead of him, but hopefully is a resilient little pup and hopefully should make a full recovery. I will definitely keep you updated on any improvements or significant happenings in his recovery path as they happen. Thank you again for the well-wishes and prayers for our little fur fella--we appreciate it so much!